Cyrus Najmabadi's popular movie-times application BoxOffice [Free, App Store] is back in the App Store. BoxOffice was removed for unclear reasons, and the developer is unable to reveal any details. There has been some speculation that it related to the use of Rotten Tomato ratings as some similar applications had also been pulled. Regardless, the application is back and still provides Rotten Tomato ratings. 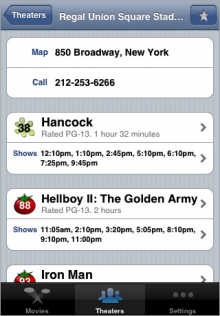 The application allows you to browse local theatres, show times, ratings and trailers. Tickets may also be purchased at participating theaters.